A strong tomato plant gets that way from a strong root system. Re-potting tomato seedlings gives roots room to grow. 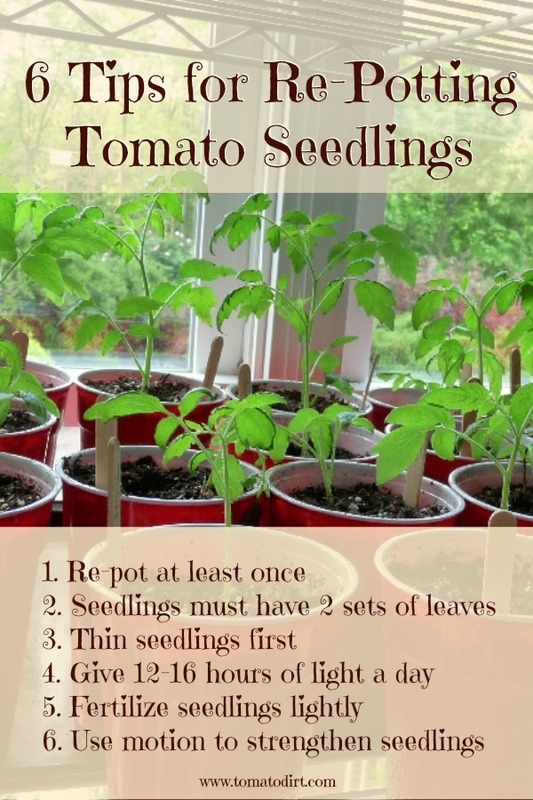 Your tomatoes will have the best chance possible to develop a healthy root system when you re-pot them at least once (sometimes two or three times) before setting them in the garden. Q. When should I re-pot my tomato seedlings? A. When your seedlings have 2 sets of leaves and the second set is at least ½” long. The first set of leaves, called cotyledon (cot-uhl-EE-din) leaves (also referred to as false leaves or seed leaves) look like wings. They provide food for your new plant while it figures out how to grow some roots and work photosynthesis to its advantage. The second set of leaves is often called “true leaves.” Be kind to them – they make chlorophyll. Soon, they’ll get the hang of food production. Then they’ll have full responsibility for feeding the plant, and the cotyledon leaves will shrivel up and say sayonara. When the first set of true leaves are about ½” long, you can re-pot. Q. What size container should I use for re-potting my tomato seedlings? A. A 4-6" container or transplant pot. You can always re-pot again to a bigger container if your seedlings get extra large or become root-bound. Make sure your containers have holes in the bottom for good drainage! Q. What kind of potting mix should I use? A. A good commercial or all-purpose potting mixture. (Find out more about which potting mix to use or how to make your own.) Most potting mixes have a small amount of fertilizer which can be helpful to seedlings. Moisten the soil before repotting and make sure it’s not too tightly compacted when filling new containers. Q. Should I thin my seedlings before transplanting? A. Plant one seedling per transplant pot when re-potting. That may mean thinning extras. Use fork tines to separate tiny seedlings. If you’re careful, you may be able to repot both plants. You can also thin seedlings by snipping stems with a manicure scissors or using a tweezers to pull small plants, leaving the strongest and best-looking plants for re-potting. Q. Can you give me some tips on the best way to do the actual re-potting? Prepare your new containers by filling them 1/3 to 1/2 with moistened soil. With a spoon or your fingers, create a small hole in the center of the container about the size of the cell in which your seedling sprouted. Water the seedlings that are about to be transplanted. Use a spoon to carefully separate the seedling’s soil from the edges of the original pot. You can also loosen the roots from the container walls by squeezing and releasing the sides of the container. Scoop the entire soil plus root into the new pot. The spoon supports the weight of the seedling and soil from the bottom. Try to keep as many roots as possible intact. A big no-no: never grab the seedling by the stem or leaves to transplant it. Bury as much of the stem as possible, allowing leaves to bush out at bottom. Add moistened soil around the bottom set of leaves. Gently press soil around newly-potted plant. Q. Should I fertilize re-potted tomato seedlings? Q. How important is good lighting? A. Very. Give your re-potted seedlings 12-16 hours of light a day so they grow strong and healthy. 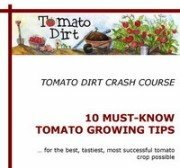 Insufficient light can lead to leggy or stunted tomatoes – not a recipe for a robust start. Q. How do I know if my tomato seedling needs to be potted a second time? A. When it gets too big for the pot or gets root-bound, it’s time to move up to a bigger container. Make sure your pot is no bigger than one gallon.